Hertz Furniture&apos;s tough and organized basket racks will make a great addition to any locker room, gym or workout space. Basket lockers are an excellent alternative to classic gym lockers because they take up less space and provide improved ventilation. What kinds of locker baskets can you put on your racks? Metal baskets with varying degrees of perforation help diffuse the smells of wet, sweaty or dirty clothing and sports equipment. We offer a selection of locker sizes and basket styles so you can choose the ideal arrangement for your workout space. Where is a good place for basket lockers? If your school has a small locker room, no locker room or simply needs some extra personal storage space, basket lockers are an excellent option. These sturdy units are constructed from durable 20- and 13-gauge steel which won&apos;t easily get bent out of shape. They are built to hold individual metal baskets. Their high capacity and small footprint enables you to provide each student with a personal storage space. Your team works hard during practices and games, so you want to make sure that they can keep their heads in the game rather than worrying about misplaced items. With individually-numbered locker baskets, each player can easily find their personal equipment, uniforms and clothing. This easy identification system saves time as athletes suit up for a game or wash up after practice. Rather than having to scramble around to locate their clothes and make it back to class in time, students can easily find what they are looking for and get ready for the next part of their day. How can I prevent theft in the locker room? Unfortunately, theft does sometimes occur in school locker rooms. In order to ensure that athletes don&apos;t have to worry about their belongings while they are out there playing, you need to make sure that there is secure individual storage for each student. Penco basket lockers have personal security for every basket. Each basket locker has an individual padlock hasp which accommodates a lock of choice that will prevent unauthorized access. Additionally, each basket space is separated by 3” dividers on each side, which prevent access through adjacent openings. 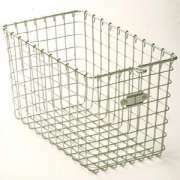 What kind of metal baskets should you get? 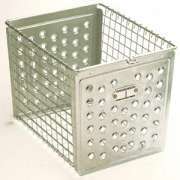 Metal baskets for Penco racks come in a choice of styles. Perforated fronts and backs keep contents hidden from view, while still providing great ventilation. If you prefer to have greater airflow and viewable contents, full wire baskets are the way to go. You might even want to consider getting a few of each and seeing which kind works best for your students. 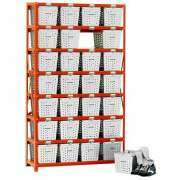 In order to determine which racks and baskets are best for your space, consider basket size and rack capacity. 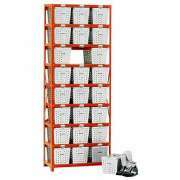 Basket lockers fit different amounts of baskets depending on their size and configuration, so make sure you order baskets and racks in corresponding sizes. Just like students like to have their own school lockers, ideally each student will get their own locker basket as well. How should the basket lockers be arranged? Individual basket racks fit well against a wall. 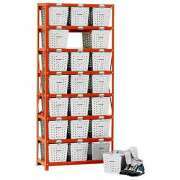 You can order multiple units to create long rows, or get basket lockers that hold wire baskets in a number of different sizes. If you plan on placing your unit in a more open space, and you need more metal baskets than an individual basket rack can hold, you also have the option of bolting racks together to create double-faced units. Basket racks are a great alternative to gym lockers. They take up less space and offer better airflow, while providing security and individual storage. They are the perfect size for jerseys, swim trunks, knee pads, small personal sports equipment and more. Hertz Furniture&apos;s versatile basket racks will help keep your locker room organized so student athletes can easily find their uniforms and equipment. Basket lockers provide great air-flow, and are a budget-friendly solution for gym storage. If you need help choosing the best size and style for your school, call the Hertz Design Center for free project-planning advice from the experts.